Have a TOM that is a little problematic right now. 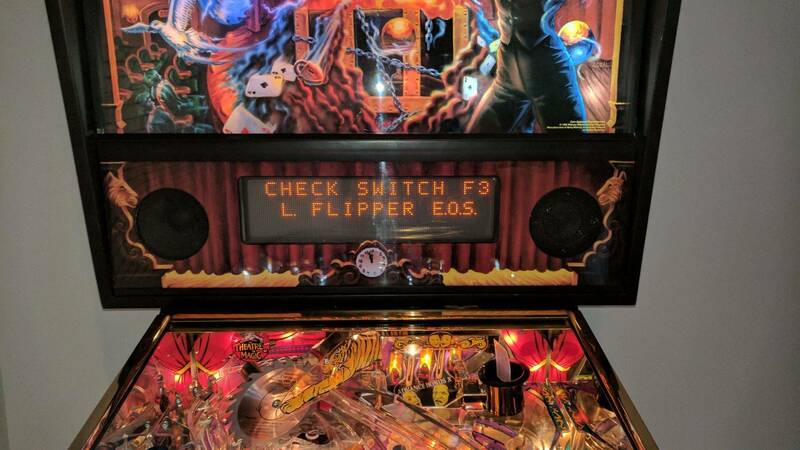 Getting the error "Check Switch F3 Left Flipper E.O.S" when I turn the game on. I've replaced both flipper assemblies (as the existing ones looked a bit beat up) and the error remains. You have a lot of possibilities here. Follow those wires back are they shorted on the way back to...guessing it's a fliptronic board in the head? Are the EOS switches new? Are they properly gapped? Did this problem happen as soon as you rebuilt the flippers? Brand New assemblies. Problem came up before and after installing them. It appears that ToM has a Fliptronics board for the flippers. According to Clay's guide, it looks like games that have a Fliptronics board should have the EOS switches gapped normally open (meaning they should close when the flipper is activated). Check the left flippers EOS switch. Is it gapped properly? Could the 3/8A fuses on the Dot Matrix board have anything to do with this? Noticed a lot of corrosion on them and not getting a strong reading on my DMM. I doubt there's any correlation there, but i could wrong. Researching the problem a bit more, it looks like it would be worth taking a close look at the wiring to the EOS switches (both). Apparently it's not uncommon for a wire to break off one of the switches solder lugs. Gently pull on each wire going to them to be sure the wiring is firmly attached. I would also clean the switches by swiping a business card or folded up piece of paper between the contacts a couple times to be sure they're making good contact. This morning (and last night) decided to try and solve this EOS issue. Finally I am close I think. 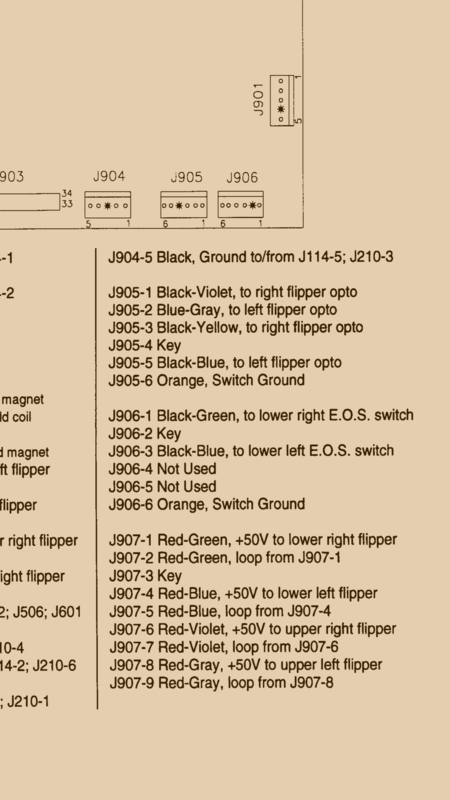 Seems like the black/blue wire from the left flipper EOS is going into Pin 2 of the J906 (Fliptronics) which is a dead pin. Someone in the past may have installed this incorrectly and it's been going along for the ride ever since. So question is which pin on J906 is this black/blue wire from the left flipper EOS suppose to go to? Currently the orange wire that is common to both the left and right EOS goes into pin 6 on J906 and the black/green wire from the right EOS goes into pin 1 on J906. All I'm left is for someone to check where the black/blue wire from the left EOS goes into which pin on J906. The weird thing is that all pins except pin 2 have traces going somewhere yet the plug only has 3 wires. If someone could take a nice close up of J906 with the wires that would be of great help! According to the manual, looks like that black/blue wire should be going to pin 3. Yup figured it out by looking at the pdf manual on ipdb. Some expert along the way changed it to pin 2. I changed it back to pin 3 and no more EOS error! Sweet!